As a child playing Hide and Seek, I remember closing my eyes, counting, and then yelling out, “Here I come, ready or not!” We as Christians are in a spiritual battle, ready or not. In September I accepted the challenge of leading InScribe Christian Writers’ Fellowship (ICWF) by becoming the president. Edward Bulwer-Lytton said, “The pen is mightier than the sword.” Words are powerful and can be used for good or evil. The members of ICWF all seek to honour God with their words. God is using those words to change people’s lives. Although I knew in theory that I would be subjected to spiritual attacks because of my leadership position, I wasn’t totally prepared. In this past year I have experienced struggles in areas where I never struggled before, or at least not to the same extent. Other members of the executive have also shared battles they are facing. Yesterday I commented, “We’re in the lion’s den.” Thankfully, we serve the same God that Daniel served. We’re not in this battle alone! God has provided weapons for us to use, but we need to choose to use them – not once, but every day. Too often I rush into the fray in my own strength. Too often I see other people as the “enemy” instead of remembering that my battle is against spiritual forces. Too often I fail to wait on God; I fail to pray for His strength, guidance, and protection. I find it amazing that God chooses to use weak, frail, imperfect people like me to accomplish His will. Heavenly Father, teach me to pray. Help me to wait on you and your perfect timing in my life and ministry. Thank you for the protection, armor and weapons you provide. Help me to take them up, to step out and do battle. Help me to be faithful in the things you’ve given me to do. Thank you that the battle is not mine, but yours. Thank you that the victory is up to you. Help me to be obedient in doing what you give me to do and to trust you for the results. In Jesus Name, Amen. Every time I enter something new that will impact the Kingdom Satan doesn’t like it. And knowing we will have these battles ahead of time certainly helps us prepare. Blessings to you as you lead Inscribe into God’s future. “Too often I rush into the fray in my own strength. Too often I see other people as the “enemy” instead of remembering that my battle is against spiritual forces.” Thank you for this statement, Ruth!!! I, too, need to recalibrate. Often! The problem is not that Satan appears as an angel of light in these cases, it’s that he appears as an ordinary person that we might expect to have a decent relationship with! And it’s a challenge to remember, when I do click in that this is spiritual battle, NOT to battle the person. 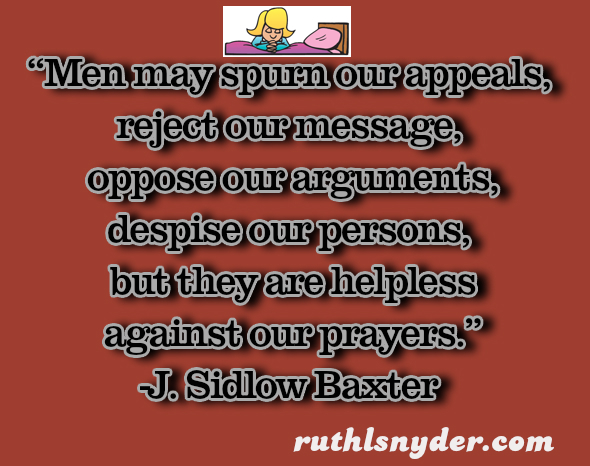 Thanks for this timely reminder, Ruth. Well done. Your comment made me smile. You said it so well – “he appears as an ordinary person that we might expect to have a decent relationship with!” May God grant us discernment, love, and a willingness to forgive. Ruth, being aware that we are in a battle is so important and spreading that awareness is important too! I find now days, so many Christians, and churches don’t want to talk about the truth and that is – Satan is after us! He is a liar and the author of confusion! God has given us the Holy Spirit and The Bible and an Arsenal of weapons.and defense but we have to study what they are and how to use them. Because the devil does not fight fair and he will come after us from the time we are children. He does not want God to get the glory!